Business Email >	Why US? Beyond your imagination - up to 35GB per mailbox to meet your fast growing business requirements! You can send and receive large attachments - up to 50 MB x 6 at a time which is 3-6 times larger than that of other email products. We provide 4-layer self-study intelligent filtration system with high anti-spam/virus quality. Your emails and data are protected by strong SSL encryption on the mail system. Secure Sockets Layer (SSL) protocols allow client/server applications to communicate in a way designed to keep communication privacy. An optional feature just by simple settings in Administrator Control Panel. 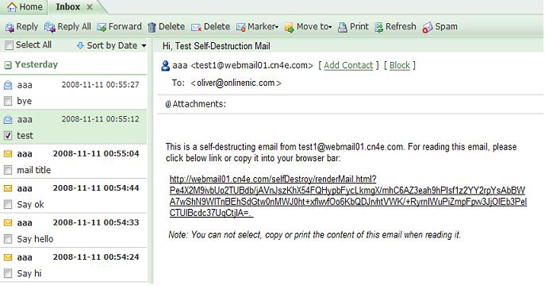 Administrator can easily track all in/outbound mails within the mail domain. By setting the tracking feature,specified mails will be copied to specified recipients, and there will be no sign of tracking visible to others and without any impact to original mails. This feature nicely meets the requirement of mail security management. You can easily control emails being sent or received within the domain. This is an optional feature just by simple settings in Administrator Control Panel. You can always get emails from the White List. Any emails from senders on your White List will always be delivered to your mailbox and never be marked as SPAM. You can block emails from the Black List. Any emails from senders on your Black List will never be delivered to your mailbox. You can customize filtration rules to block the SPAM emails. Email filters allow you to filter emails based on either the content or from address. You can create or view your personal contact lists, or share group contact lists with other users on the mail system. POP (Post Office Protocol) is a client/server protocol in which emails are received and held for you on the server. IMAP(Internet Message Access Protocol) is a standard protocol for accessing emails from your local server. You can access your emails, contact lists and more through any internet connection with POP3, IMAP and webmail. You can use your favorite email client (Outlook, Eudora, Netscape, etc.) to send or receive emails. You can create a mailbox accessible via POP or IMAP protocol to send or receive the third party emails just by setting mail server / IP address and port number. You may also choose whether or not to leave a copy of the emails on the incoming mail server. Email alias is a virtual email address that does not have actual mailbox with storage. Email aliases are useful - when your real email account changes, or if you want to receive emails from many generic addresses, you can just point your alias to the new address. For example, you can create an email alias called feedback@yourdomain.com, and point it to john@yourdomain.com which has a mailbox. But when john@yourdomain.com will not be used or if you want to receive emails from the new mailbox tom@yourdomain.com, you can point the email alias feedback@yourdomain.com to tom@yourdomain.com. You can forward a copy of all incoming emails to one or more other email addresses. The other email address can be alias, an existing mail account or an external email address. You can auto-forward emails delivered to you to another email address. If you will be away on vacation and unavailable to respond to emails, you may configure an auto-responder email to notify the sender. Auto Responder is also used to notify the sender that the existing email address is changed or ceased. You can share your calendar with other users on the mail system, or view other users' tasks in your own calendar. Web-based Admin Control Panel allows non-technical people to manage users within their domain from a browser. The Administrator can configure Email Account Settings, Screen Settings, upload Logo/Banner, Filtering Rules, Address Book, Mail Group Manage, Email Tracking, update Account Info, Contact Info, Change Password, Sysadmin Accounts. You can upload your company Banner/Logo to the webmail page. You can subscribe emails from your Inbox by RSS reader. You can upload your files to Portfolio Folder. The maximum file is up to 50 MB at a time. You can add your favorite website addresses to Favorite. The latest Ajax technology can speed up your page browsing so that you can enjoy such wonderful smoothness and swiftness. 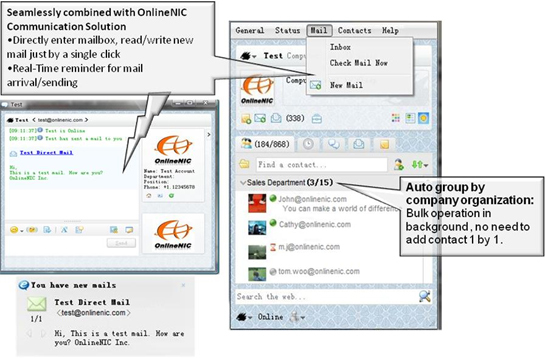 You can select a specific language in which you want to view the webmail Interface and Online Help. Expert Instant Messenger for Enterprise, why expert It is a Smart & direct communicator, not only covers messages but also emails directly! When a new mail arrives, it will present you the email contents directly in the POP up window, then you can read, even write a mail just with it. You don't need to worry about delay or miss any mail. That is powered by OnlineNIC's unique technology - Mail On-the-Fly(TM).